The Laurel and Hardywood Convention is pleased and proud to announce that actors Chuck McCann and Jim MacGeorge will be appearing at the convention. At this point they will perform at the Farewell Brunch and add excitement and fun to the climax of the conclave. Jim MacGeorge is an actor/comedian who did the voice of Oliver Hardy in the Laurel and Hardy cartoons. He also supplied the voice for Uncle Captain Horatio K. Huffenpuff in Beany and Cecil. He was a charter member of the Way Out West Tent attending the tent’s very first meeting. And of course we all remember and appreciate Jim as he appeared in so many commercials with Chuck as Stan Laurel and Oliver Hardy! Besides being a Founding Member of the Sons of the Desert, Chuck McCann has appeared in hundreds of movies and TV shows. The Projectionist, Robin Hood: Men in Tights, Duck Tales, Boston Legal and Far Out Space Nuts to name but a few. 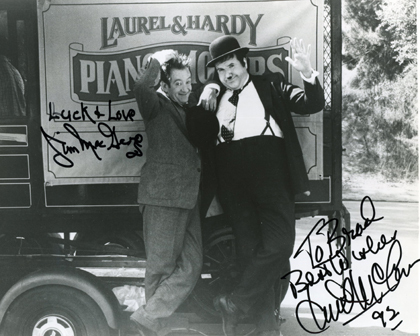 Chuck’s local TV show in New York City, Laurel and Hardy and Chuck brought the boys to a whole new generation. And everyone remembers those funny Right Guard commercials of the 1970’s (Hi Guy!). We are all in for a treat as Chuck and Jim take the stage!